“It feels really, really cool to win here finally at Bristol,” said Larson, who won for the fourth time in six starts this season and the 12th time in his career. “I’ve been close so many times. It’s my best race track by far, I feel like—this and Homestead. Larson had to hold off Justin Allgaier and Cole Custer to get the win. In Saturday night’s Bass Pro Shops NRA Night Race, Larson will go far a double in the Monster Energy NASCAR Cup Series event (6:30 p.m. ET on NBCSN, PRN and SiriusXM NASCAR Radio). Before Friday’s Xfinity race, he won the pole for the Cup race in the sister No. 42 Chip Ganassi Racing Chevrolet. “Hopefully, we can get another tomorrow night, and that would be really special as well,” said Larson. “It’s just really exciting because I’ve been so close so many times, and I thought Bell was going to steal this one from me a couple times throughout the race. He was really good. He and I have very similar driving styles. Pole winner Kyle Busch was dominant in the early going, building a lead of more than five seconds and lapping up to the 12th position before disaster struck on Lap 66. Busch drove high through Turns 1 and 2, shot through a layer of rubber at the top of the track and scraped the outside wall. He was still leading on Lap 70 when his right front tire deflated, sending the No. 18 Toyota into the Turn 2 wall again and finally into the barrier in Turn 3. Busch brought his car to pit road and ultimately retired from the race with a broken front suspension. 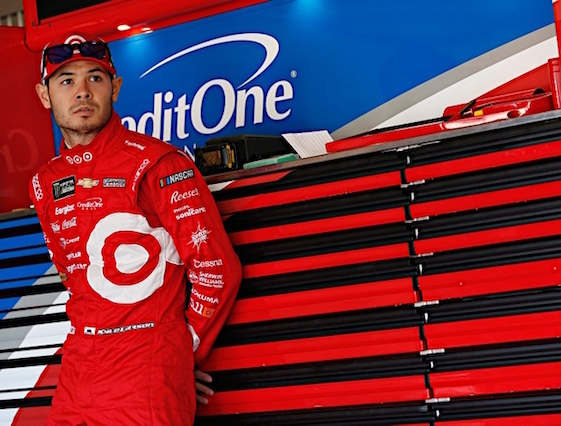 (3) Kyle Larson(i), Chevrolet, 310. (2) Christopher Bell #, Toyota, 310. (10) Justin Allgaier, Chevrolet, 310. (9) Cole Custer, Ford, 310. (4) Joey Logano(i), Ford, 310. (6) Elliott Sadler, Chevrolet, 310. (22) Michael Annett, Chevrolet, 310. (15) Chase Elliott(i), Chevrolet, 310. (14) Tyler Reddick #, Chevrolet, 310. (5) Matt Tifft, Chevrolet, 310. (21) Ryan Sieg, Chevrolet, 310. (18) Ross Chastain, Chevrolet, 309. (19) Jeremy Clements, Chevrolet, 308. (17) Austin Cindric #, Ford, 308. (8) Ty Dillon(i), Chevrolet, 307. (25) Garrett Smithley, Chevrolet, 305. (16) Ryan Reed, Ford, 304. (26) Joey Gase, Chevrolet, 304. (23) BJ McLeod, Chevrolet, 304. (27) JA Junior Avila, Chevrolet, 304. (32) David Starr, Chevrolet, 303. (12) Ryan Truex, Chevrolet, 302. (20) Alex Labbe #, Chevrolet, 301. (11) Daniel Hemric, Chevrolet, Accident, 300. (35) Spencer Boyd #, Chevrolet, 299. (29) Jeff Green, Chevrolet, Fuel Pump, 298. (38) Bayley Currey(i), Toyota, 288. (28) Josh Williams, Chevrolet, Suspension, 278. (7) Brandon Jones, Toyota, Suspension, 260. (30) Chad Finchum #, Toyota, Accident, 195. (39) Stephen Leicht, Chevrolet, Overheating, 192. (34) Vinnie Miller #, Chevrolet, Transmission, 179. (36) Carl Long, Chevrolet, Suspension, 174. (13) Chase Briscoe, Ford, Accident, 142. (37) Josh Bilicki #, Toyota, Transmission, 102. (1) Kyle Busch(i), Toyota, Accident, 74. (24) Ray Black II, Chevrolet, Engine, 36. (31) Timmy Hill, Toyota, Overheating, 22. (40) Morgan Shepherd, Chevrolet, Vibration, 12. (33) JJ Yeley, Chevrolet, Brakes, 9. Average Speed of Race Winner: 82.306 mph. Time of Race: 02 Hrs, 00 Mins, 27 Secs. Margin of Victory: 0.434 Seconds. Caution Flags: 8 for 59 laps. Lap Leaders: K. Busch(i) 1-69; K. Larson(i) 70-73; J. Logano(i) 74; C. Custer 75-79; K. Larson(i) 80-113; J. Logano(i) 114; K. Larson(i) 115-172; C. Elliott(i) 173; E. Sadler 174-185; C. Bell # 186-203; K. Larson(i) 204-261; C. Elliott(i) 262; K. Larson(i) 263-310. Leaders Summary (Driver, Times Lead, Laps Led): K. Larson(i) 5 times for 202 laps; K. Busch(i) 1 time for 69 laps; C. Bell # 1 time for 18 laps; E. Sadler 1 time for 12 laps; C. Custer 1 time for 5 laps; J. Logano(i) 2 times for 2 laps; C. Elliott(i) 2 times for 2 laps.